This article is about the straight-winged version of the F-84. For the swept-winged version, see F-84F Thunderstreak. The Republic Aviation Company F-84 Thunderjet was an American-built turbojet fighter-bomber aircraft. Originating as a 1944 United States Air Force proposal for a daytime fighter, the F-84 flew in 1946. Although it entered service in 1947, the Thunderjet was plagued by so many structural and engine problems that a 1948 Air Force review declared it unable to execute any aspect of its intended mission and considered cancelling the program. The aircraft was not considered fully operational until the 1949 F-84D model and the design matured only with the definitive F-84G introduced in 1951. In 1954, the straight-wing Thunderjet was joined by the swept-wing F-84F Thunderstreak fighter and RF-84F Thunderflash photo reconnaissance aircraft. The USAF Strategic Air Command had F-84 Thunderjets (F-84s and RF-84s) in service from 1948 through 1957. The Thunderjet became the Air Force's primary strike aircraft during the Korean War, flying 86,408 missions and destroying 60% of all ground targets in the war as well as eight Soviet-built MiG fighters. Over half of the 7,524 F-84s produced served with NATO nations, and it was the first aircraft to fly with the U.S. Air Force Thunderbirds demonstration team. The F-84 was the first production fighter aircraft to utilize in-flight refueling and the first fighter capable of carrying a nuclear bomb. Modified F-84s were used in several unusual projects, including the FICON and Tom-Tom dockings to the B-29 and B-36 bomber motherships, and the experimental XF-84H Thunderscreech supersonic turboprop. In 1944, Republic Aviation's chief designer, Alexander Kartveli, began working on a turbojet-powered replacement for the P-47 Thunderbolt piston-engined fighter. The initial attempts to redesign the P-47 to accommodate a jet engine proved futile due to the large cross-section of the early centrifugal compressor turbojets. Instead, Kartveli and his team designed a brand-new aircraft with a streamlined fuselage largely occupied by an axial compressor turbojet engine and fuel stored in rather thick unswept wings. On 11 September 1944, the United States Army Air Forces released General Operational Requirements for a day fighter with a top speed of 600 mph (521 knots, 966 km/h), combat radius of 705 miles (612 nm, 1,135 km), and armament of either six 0.50 inch (12.7 mm) or four 0.60 inch (15.2 mm) machine guns. In addition, the new aircraft had to use the General Electric TG-180 axial turbojet which entered production as Allison J35. On 11 November 1944, Republic received an order for three prototypes of the new XP-84. Since the design promised superior performance to the P-80 Shooting Star and Republic had extensive experience in building single-seat fighters, no competition was held for the contract. The name Thunderjet was chosen to continue the Republic Aviation tradition started with the P-47 while emphasizing the new method of propulsion. On 4 January 1945, even before the aircraft took to the air, the USAAF expanded its order to 25 service test YP-84A and 75 production P-84B (later modified to 15 YP-84A and 85 P-84B). Meanwhile, wind tunnel testing by the National Advisory Committee for Aeronautics revealed longitudinal instability and buckling of stabilizer skin at high speeds. The weight of the aircraft, a great concern given the low thrust of early turbojets, was growing so quickly that the USAAF had to set a gross weight limit of 13,400 pounds (6,078 kg). The results of preliminary testing were incorporated into the third prototype, designated XP-84A, which was also fitted with a more powerful J35-GE-15 engine with 4,000 pound-force (17.80 kN) of thrust. The first prototype XP-84 was transferred to Muroc Army Air Field (present-day Edwards Air Force Base) where it flew for the first time on 28 February 1946 with Major William A. Lien at the controls. It was joined by the second prototype in August; both aircraft flying with J35-GE-7 engines producing 3,745 pound-force (16.66 kN) of thrust. The fifteen YP-84As delivered to Patterson Field (present-day Wright-Patterson Air Force Base) for service tests differed from XP-84s in having an upgraded J35-A-15 engine, carrying six 0.50 inch (12.7 mm) Browning machine guns (four in the nose and one in each wing root), and having the provision for wingtip fuel tanks holding 226 US gallon (870 L) each. Due to delays with delivery of jet engines and production of the XP-84A, the Thunderjet had undergone only limited flight testing by the time production P-84Bs began to roll out of the factory in 1947. In particular, the impact of wingtip tanks on aircraft handling was not thoroughly studied which proved problematic later. The F-84B, which differed from YP-84A only in having faster-firing M3 machine guns, became operational with 14th Fighter Group at Dow Field, Bangor, Maine in December 1947. Flight restrictions followed immediately, limiting maximum speed to Mach 0.8 due to control reversal, and limiting maximum acceleration to 5.5 Gs due to wrinkling of fuselage skin. To compound the problem, parts shortages and maintenance difficulties earned the aircraft the nickname "Mechanic's Nightmare". On 24 May 1948, the entire F-84B fleet was grounded due to structural failures. A 1948 review of the entire F-84 program discovered that none of the F-84B or F-84C aircraft could be considered operational or capable of executing any aspect of their intended mission. 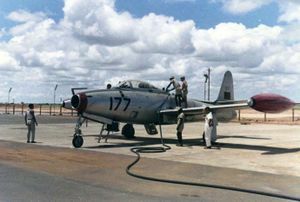 The program was saved from cancellation by the fact that the F-84D, whose production was well underway, had satisfactorily addressed the major faults. A fly-off against the F-80 revealed that while the Shooting Star had a shorter takeoff roll, better low altitude climb rate and superior maneuverability, the F-84 could carry a greater warload, was faster, had better high altitude performance and greater range. As a temporizing measure, the USAF in 1949, committed US$8 million to implement over 100 upgrades to all F-84Bs, most notably reinforcing the wings. Despite the resultant improvements, the F-84B was withdrawn from active duty by 1952. The F-84C utilized a somewhat more reliable J35-A-13 engine and some engineering refinements. Being virtually identical to the F-84B, the C model suffered from all of the same defects and underwent a similar structural upgrade program in 1949. All F-84Cs were withdrawn from active service by 1952. The structural improvements were factory-implemented in the F-84D which entered service in 1949. Wings were covered with thicker aluminum skin, the fuel system was winterized and capable of using JP-4 fuel and a more powerful J35-A-17 engine with 5,000 pound-force (22.24 kN) thrust was fitted. It was discovered that the untested wingtip fuel tanks contributed to wing structural failures by inducing excessive twisting during high-G maneuvers. To correct this, small triangular fins were added to the outside of the tanks. The F-84D was phased out of USAF service in 1952 and left Air National Guard service in 1957. The first effective and fully-capable Thunderjet was the F-84E model which entered service in 1949. The aircraft featured the J35-A-17 engine, further wing reinforcement, a 12 inch (30 cm) fuselage plug in front of the wings and 3 inch (76 mm) plug aft of the wings to enlarge the cockpit and the avionics bay, an A-1C gunsight with APG-30 radar and provision for an additional pair of 230 US gallon (871 L) fuel tanks to be carried on underwing pylons. The latter increased the combat radius from 850 to 1,000 miles (740 to 870 nm, 1,370 to 1,610 km). Despite the improvements, the in-service rates remained poor with less than half of the aircraft operational at any given time. This was primarily due to severe shortage of spares for the Allison engines. The expectation was that F-84Es would fly 25 hours per month, accumulating 100 hours between engine overhauls. The reality of Korean War and NATO deployments rapidly outpaced the supply and Allison's ability to manufacture new engines. The F-84E was withdrawn from USAF service in 1956, lingering with ANG units until 1959. The definitive straight-wing F-84 was the F-84G which entered service in 1951. The aircraft introduced a refueling boom receptacle in the left wing, autopilot, Instrument Landing System, J35-A-29 engine with 5,560 pound-force (24.73 kN) of thrust, and the ability to carry a single Mark 7 nuclear bomb. The F-84G was retired from USAF in the mid-1960s. Typical of most early jets, the Thunderjet's takeoff performance left much to be desired. In hot Korean summers with a full combat load, the aircraft routinely required 10,000 feet (3,050 m) of runway for takeoff even with the help of RATO bottles (two or four of these were carried, each producing 1,000 pound-force (4.45 kN) of thrust for 14 seconds). All but the lead aircraft had their visibility obscured by the thick smoke from the rockets. Early F-84s had to be pulled off the ground at 140 knots (160 mph, 260 km/h) with the control stick held in the rearmost position. Landings happened at a similar speed (for comparison, the P-51 Mustang landed at approximately 100 knots (120 mph, 190 km/h)). Despite the "hot" landing speeds, the Thunderjet was easy to fly on instruments and crosswinds did not present much of a problem. Thanks to the thick straight wing, the Thunderjet, which was otherwise blessed with good aerodynamics, rapidly reached its Mach 0.82 limitation at full throttle and low altitude. The aircraft had sufficient power to fly faster but exceeding the Mach limit at low altitudes resulted in a violent pitch-up and structural failure causing the wings to fall off. Above 15,000 feet (4,600 m), the F-84 could be flown faster but at the expense of severe buffeting. Fortunately, the airspeed was sufficiently easy control to make safe dive bombing from 10,000 feet (3,000 m) possible. The top speed limitation proved troublesome against Soviet Mikoyan-Gurevich MiG-15s in Korea. Slower than the MiG, the F-84 was also unable to turn tightly with a maximum instantaneous-turn load of only 3 Gs followed by rapid loss of airspeed. One F-84E pilot credited with two MiG kills achieved his second victory by intentionally flying his aircraft into pitch-up. The MiGs chasing him were unable to follow the violent maneuver and one crashed into the ground. Luckily for the pilot, the aircraft did not disintegrate but the airframe did suffer heavy warping. The F-84 was a stable gun platform and the computing gunsight aided in accurate gunnery and bombing. Pilots praised the aircraft for Republic's legendary ruggedness. Pilots nicknamed the Thunderjet "The Lead Sled." It was also called "The Iron Crowbar," "a hole sucking air," "The Hog " ("The Groundhog"), and "The World's Fastest Tricycle" as a testament to its long takeoff rolls. F-84 lore stated that all aircraft were equipped with a "sniffer" device that, upon passing V2, would look for the dirt at the end of the runway. As soon as the device could smell the dirt, the controls would turn on and let the pilot fly off the ground. In the same vein, it was suggested a bag of dirt should be carried in the front landing gear well. Upon reaching V2, the pilot would dump the dirt under the wheels, fooling the sniffer device. The F-84 flew a total of 86,408 missions, dropping 111,171,000 pounds (50,427 tons) of bombs and 12,258,000 pounds (5,560 tons) of napalm. The USAF claimed F-84s were responsible for 60 percent of all ground targets destroyed in the war. Notable F-84 operations included the 1952 attack on the Sui-ho Dam. During the war, the F-84 became the first USAF fighter to utilize aerial refueling. In aerial combat, F-84 pilots were credited with eight MiG-15 kills against a Soviet-claimed loss of 64 aircraft. The total losses were 335 F-84D, E and G models. The F-84 was the first aircraft flown by the U.S. Air Force Thunderbirds, which operated F-84 G Thunderjets from 1953 to 1955 and F-84 F Thunderstreaks from 1955 to 1956. The F-84E was also flown by the Skyblazers team of United States Air Forces Europe (USAFE) from 1950 to 1955. On 1946-09-07, the second XP-84 prototype set a national speed record of 607.2 mph (527.6 knots, 977.2 km/h) -- a bit slower than the world record 612.2 mph (532.0 knots, 985.2 km/h) held by the British Gloster Meteor. On 1950-09-22, two EF-84Es flew across the North Atlantic from Great Britain to United States. One aircraft ran out of fuel over Newfoundland but the other successfully made the crossing which took 10 hours 2 minutes and three aerial refuelings. The flight demonstrated that large numbers of fighters could be rapidly moved across the Atlantic. On 20 August 1953, 17 F-84Gs utilizing aerial refueling flew from United States to United Kingdom. The 4,485 mile (3,900 nm, 7,220 km) journey was the longest-ever nonstop flight by jet fighters. The costs are in approximately 1950 United States dollars and have not been adjusted for inflation. The third prototype with a more powerful J35-GE-15 engine. Two F-84Bs converted into parasite fighters to be attached to the wingtips of an ETB-29 bomber as part of Project Tom-Tom. J35-A-17D engine, Sperry AN/APG-30 radar-ranging gunsight, fuselage stretched 12 in (30 cm) to enlarge the cockpit, retractable attachements for RATO bottles, inboard wing hardpoints made "wet" to permit carrying an additional pair of 230 US gal (885 L) fuel tanks. Can be distinguished from earlier models by the presence of two fuel vents on ventral rear fuselage. Most aircraft were retrofitted with F-84G-style reinforced canopies; 843 built. Two F-84Es were converted into test prototypes, to test various methods of air-to-air refuelling. Single-seat fighter-bomber capable of delivering the Mark 7 nuclear bomb using the LABS, J35-A-29 engine, autopilot, capable of in-flight refueling using both the boom (receptacle in left wing leading edge) and drogue (probe fitted to wingtip fuel tanks), introduced the multi-framed canopy which was later retrofitted to earlier straight-winged F-84s. 3,025 built (1,936 for NATO under MDAP). Zero length launch version for point defense, used the booster rocket from MGM-1 Matador cruise missile, did not enter production. 80 ex-USAF F-84Bs converted into target drones for the United States Navy. ↑ 1.00 1.01 1.02 1.03 1.04 1.05 1.06 1.07 1.08 1.09 1.10 1.11 1.12 1.13 1.14 1.15 1.16 1.17 1.18 1.19 1.20 Knaack, Marcelle Size. Encyclopedia of US Air Force Aircraft and Missile Systems: Volume 1 Post-World War II Fighters 1945-1973. Washington, DC: Office of Air Force History, 1978. ISBN 0-912799-59-5. ↑ 2.0 2.1 2.2 2.3 2.4 2.5 2.6 McLaren, David. Republic F-84 Thunderjet, Thunderstreak & Thunderflash: A Photo Chronicle. New York: Schiffer Military/Aviation History, 1998. ISBN 0-7643-0444-5. ↑ 3.0 3.1 3.2 3.3 3.4 Higham, R. and Williams, C. Flying Combat Aircraft of USAAF-USAF (Vol.1). Rockville, Maryland: Air Force Historical Foundation, 1975. ISBN 0-8138-0325-X. Bowers, PM, Angellucci, E. The American Fighter. New York: Orion Books, 1987. ISBN 0-517-56588-9. Donald, David and Lake, Jan, eds. Encyclopedia of World Military Aircraft. London: AIRtime Publishing, 1996. ISBN 1-880588-24-2. Forrer, F.The Fun of Flying. Hollands Glory, 1992 ISBN 0-9714490-3-1. This page was last edited on 6 March 2007, at 06:21.